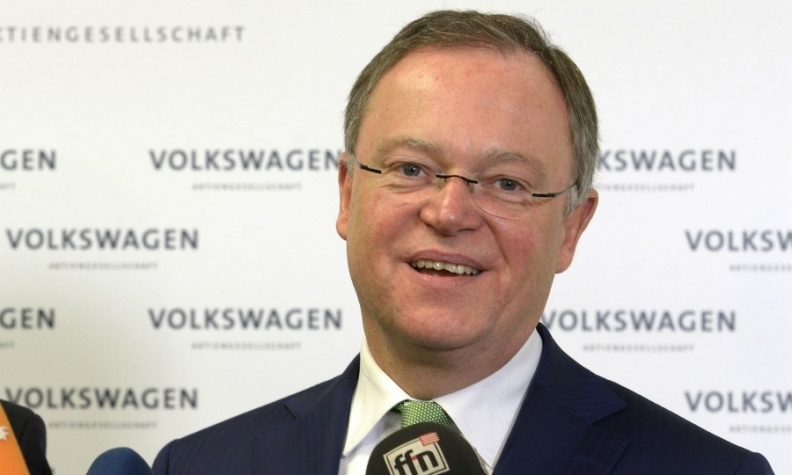 Weil called VW a "pearl" of German industry but removed criticism from his speech, a newspaper report said. BERLIN -- Stephan Weil, the premier of Germany's Lower Saxony, which owns a fifth of Volkswagen Group's voting rights, rejected as groundless a newspaper report that said he softened a speech critical of the automaker in the diesel-emissions scandal at VW's request. Weil, who faces an election next month after the defection of a member of his ruling coalition to Chancellor Angela Merkel's conservatives, is under fire for what some see as a too-cozy relationship with the company. The mass circulation newspaper Bild am Sonntag on Sunday quoted a VW employee as saying that the company "rewrote and watered down" an October 2015 speech by Weil to the state legislature about the diesel scandal after Weil shared a draft with the company. "This was no fact check," the paper quoted the employee as saying. Weil, a member of VW's supervisory board, called VW "a pearl of German industry" in the speech, but other passages were removed, the newspaper reported, including one in which he said company officials should be held accountable "regardless of their place in the hierarchy." "The allegations being made are completely unfounded," Weil told reporters on Sunday. "The core of the text remained completely unchanged." Weil said he had asked VW to check the speech for legal and factual issues given the gravity of the situation facing the company, which was in discussions at the time with U.S. officials about rigged emissions tests. He said some suggested changes were adopted, while others were not. His office released two versions of the text that verified his statement. Weil said his speech remained sharply critical of VW leadership for not disclosing the emissions issue until a year after it first began discussions with U.S. officials. His office said there had been no consultation about speeches or remarks with VW for several months because the "situation between VW and the U.S. authorities has now been cleared up." A VW spokesman said it was common practice for supervisory board members to coordinate statements about corporate issues with the company. "Every member of the supervisory board has an obligation with regard to the company's interests and, based on the stock corporation act, has to adhere to the confidentiality interests of the company," the spokesman said in emailed comments. Lower Saxony will hold new elections on Oct. 15 after a Greens party member defected to the conservatives on Friday, costing the Social Democrat-Greens coalition government its one-seat majority. Conservatives called for the resignation of Weil, a Social Democrat, after the report claiming he had softened the speech. Weil said the controversy was clearly politically motivated. The controversy about Weil's speech erupted amid renewed questions about close ties between German politicians and German carmakers, and whether they prevented the German government from acting sooner to address the widening emissions scandal. Critics have also attacked the outcome of last week's diesel summit, saying that the German government should have insisted on harsher steps to rein in diesel emissions, but was swayed by industry to adopt less onerous measures. Bild am Sonntag published thumbnail portraits of six German politicians, including Foreign Minister Sigmar Gabriel, who have or have had in the past consulting agreements or other jobs with VW, Daimler or other bodies associated with the car industry. They included Daimler's chief lobbyist Eckart von Klaeden, a conservative politician who worked under Chancellor Angela Merkel in the chancellery until 2013. His abrupt switch to the Mercedes manufacturer prompted an investigation by Berlin prosecutors and new rules on "cooling off" periods. Thomas Steg, now VW's top lobbyist, previously served as spokesman for two German chancellors. Matthias Wissmann, who served as German transport minister from 1993 to 1998, has served as president of the VDA auto industry lobby since 2007. Cem Ozdemir, leader of the pro-environment Greens party, said the "conflation of politics and automotive industry" was damaging to Germany's reputation and posed a "threat to the foundation of our market economy."